Read on Net. Thought Good to share. 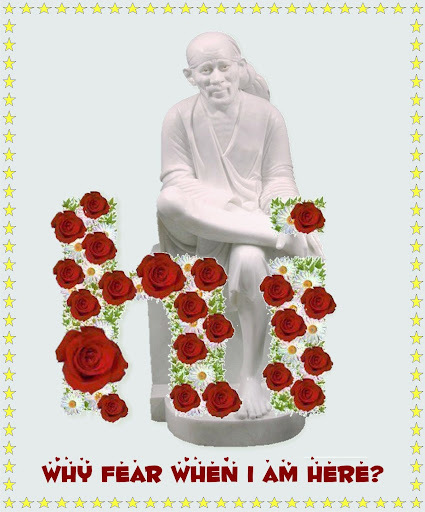 May Sai Bless All! Heal All! One of the first moods that turns our mind towards God is being unhappy or depressed because of a recent event in our life. The following is an attempt to help you in ways to understand how to overcome this temporary depression. Pray to sai : Depression is generally accompanied by fear. Read Hanuman Chalisa with its meaning once to relieve yourself of immediate depression Or read any other prayer that is your favorite. It always helps. Visit a temple: If you can, go and visit the nearest temple. Spend some time and relax your mind. Share your emotions: One of the best way to relieve stress induced by suffering is to share your emotions with your close friends or relatives who can sympathize with you. Read Bhagavad Gita: Read slokas and meaning from Gita. Gita is very effective giving a message to an anguished soul. All questions that popup in a person who is suffering and depressed are answered by God in this book. What have I done to deserve this suffering? How can I end this suffering? It is quite normal to get all these questions. You are not alone. Not everyone is happy all the time. Everyone has their own moments of happiness and suffering. If you try to talk about your problems you will see that everyone has their own share of problems. Life is a mix of happiness and suffering. When we are happy we don't question: Why am I happy? Why has God given all the happiness? When we have accepted happiness without any such questions we should also accept suffering. Reason and look for ways of overcoming the troubles. Seek counsel from elders or experts. Some of the problems cannot be overcome overnight and they need lot of preparation, patience. Face the Problems: It is in our control on how we tackle our problems: Only YOU, you can face the problems, whatever they may be and overcome them. God has given you the strength to overcome the problems. Trust yourself. Pray to sai and take guidance and work towards removal of your problems. Time will heal. Most of the times we find that time heals the wounds. Our depression will be over sometime. Don't continue to harp on the depression times. You have experienced it before and you know it. So never let any temporary depression trouble you for long. well said saibji........i must say it is only the time which makes understand!! "If you have complete faith in me, from all the burdens shall i free you." Sai bless yuo always Nimmi. Thanks Saibji for sharing the same with us. sai be great pos u r such a wonderfull person sai baba ji bless all of us on vey own time v know every night have amorning just faith our baba ji ,may sai baba bless u soon jai sai ram. I totally agree with your views except last para Sai Knows best. But I want to apologise if my words hurts you. I want to tell you that i was very bright sstudent in my schooling, i never indulges in bad habbits and always concentrate on studies but the fact is that in the last 3 years i m failing every 6 months. Even baba knows that im working hard. Whats good lying in my faliure. In todays competitive era big companies will not even call me for an interview. My family had a loan of Rs. 25 Lacs and i had to be CA to repay this loan. And failing everytime reduces the package which i can get in the market. In the nut shell i dont agree that SAI KNOWS THE BEST what best lying in my falire when all my dreams are shattered and i had a lead a life which i never expect. We should always think positive and be optimistic. Why you want to be a CA? Why not MBA, Engineer, Doctor, Teacher................any other profession? Is it your Love for Accounts or Just a status you want (Might be in past you or your parents got attracted towards this profession after looking at CA earning good and his status in neighborhood or any relative. Don’t reply to me. But just be honest. Just to share you till my 10th class, I had only one dream to be a scientist, nothing else, But today I am in profession entirely different and I am much satisfied. and who Says Job is not in market, Just leave the Big 4 Firms and some MNC’s and selected indin firms who select on Rank Basis, people respect real talent, and talent does not means clearing all groups in one go or scoring some rank in examination, But Your attitude, your confidence, Your Self Respect, Your communication skills and related knowledge etc. Show to the world what extra you can give, Spare time to study IFRS, Read Journals with interest. Be good in computer application specially for accounting and finance, Gain as much knowledge as you can, Have an eye on all latest developments in your professional areas (in next two years, one big news expected every month), analyze that. I know it is not so easy, But not so tough too and never expect companies will come to you, You have to go, If you have a perfect resume and perfect approach, Job is guaranteed, But remember No Pain No Gain. and why are depending on CA only, Can go for MBA (Finance) with ICFAI or Symbiosis under distant learning options, Doing CA, It will be easier to pursue this course. Sai Knows the best, It is only Truth. Just Same People dying to marry someone and when it delays start blaming Sai without realizing Might be Sai delaying or stopping for their Good, Because He can see future, Not We. and How it is true for you, Time will reveal this itself and you won’t take it long to understand and accept, that I am sure. So, Again, Be Strong, Be Confident and Be Enthusiastic! That’s all! Sai Ram Saib Ji . Firstly i m not contradicting you. First i want to tell u that i was never interested in CA. I was interested in some creative field but since my father is a Chartered Accountant and we were in Rajasthan where in every 2nd household there is baniya Chartered Accountant thats why my parent want me to go for this profession. I secured very good marks in 12th Standards. I was also getting admission in very good college of Delhi. But i was not allowed. Every year in my articleship my boss dont give me leave for graduation, result was below 50% in bcom. In DU correspondence if you have any idea, reslts are very poor. As far as new thing like IFRS are coming, i m updating my self. I had asked my father to pursue IFRS through piron education but he says course is costly do it on your own and my salary is not too much. Coming on MBA, my father will not allow me. He will say first complete CA. Saib ji You know only few people are successful,s do u know the reason for this. Reason is that in our middle class house holds very few students are there who had liberty to pursue the profession of which they are passionate about. I m not blaming my parents, afterall they were thinking about my future. I m just saying that when i m working Hard i should get the results. You will not belive that in my Second group lowest marks i secures is 196 and highest is 202 in last attempt with one exemption. A person securing 200 marks is Chartered Accountnat and a person securing 202 marks had to wait for 6 months. When i had secured the minimus passing marks y baba had not blessed me. About Companies, i want a status. I had seen people from big MNC's earning 10lac package that too at starting. I m not a mahatma i m also a young boy who had some dreams in his eyes. Life is not so easy. You are assuming if you will ask your parents about MBA they will refuse, But asked, Might happen they Say, Yes. Distance Learning mode course is not so costly and easily affordable even by one who is just earning 10,000 p.m., so, ask, what is to loose here, nothing, but to gain. Yes, a value addition to professional life. IFRS, why going for costly courses, the people who have just completed these course from various institutes are not satisfied. See the alternatives including online courses (By Feb'10 there will be many more options available), also at this stage, analyze the accounts of companies who have already published there accounts as per IFRS. I guess Dabur, Wipro, Infosys are some names apart from many international companies. Some books available from Rs. 250.00 to Rs.3000.00, also gain knowledge from i/net. Lots of information is available in financial forums. This is a spiritual forum and not financial, so won’t discuss much here, But only if you have will there are many ways. If you say people earning Rs. 10 Lacs at starting, these are exceptional cases. In my professional life I have seen many starting their career with Rs. 3000.00 to Rs. 5000.00 and just in 5 to 10 years getting to the level of Rs. 1 lac to 2 lacs p.m., by proving their worthiness in the company and their profession. At Last I can say only, Give your best, Love what you have, what you do instead of craving for that, not in your destiny, whether it is for a person or a profession, 99% problems of life will get solved themselves. Be Firm on your faith. Have Patience. Everything will be fine soon! Thank you Saibji for posting this...thank you so much. Rahulji... God gives us only so much as our soul's bearing capacity...whether its good or bad. We get only that much, which we can handle. He knows best whats best for our souls (not our wants). PS: IFRS - Pls check out books, internet...especially websites of the big four firms. Focus & first clear your exams... specialization can happen later. Thanks to Nimmi Ji for such a wonderful article. I just shared. If you go in different section of the forum, You will find many such insightful articles by Ramesh Ji, Tana Ji, Subhashrini Ji, Dipika Ji and beautiful poems by Saisewika Ji along with many other intelligent people. Do agree with WW. First focus on Degree, Keep yourself familiar with all development, But specialization making a perfect balance between academic and professional study.